TransCanada says its Keystone pipeline expansion would create 20,000 jobs; the State Department says it's more like 5,000. NEW YORK (CNNMoney) -- The Keystone pipeline project is back in play as part of the payroll-tax cut debate, and Congressional Republicans say it would create jobs. But there's a wide range of estimates, with one forecast that Keystone could actually cost jobs. The 1,700-mile long pipeline would transport crude oil from Canada's oil sands region in Alberta to refineries along the U.S. Gulf Coast. The Obama administration pushed back the project last month pending a review from the State Department, but Republicans want to bring it back as a sweetener to approve an extension of the payroll-tax break and federal unemployment insurance. The House passed a measure Tuesdaythat would tie tax cuts to Keystone approval. TransCanda (TRP), the company that wants to build the pipeline, says Keystone would create 20,000 "direct" jobs. That includes 13,000 construction jobs and 7,000 jobs making stuff like pump houses and the pipe itself. It also projects nearly 120,000 "indirect" jobs -- think restaurant workers and hotel employees to support the construction. TransCanada spokesman Shawn Howard defends the forecast: "If our budgets and work plans were way off, we'd lack credibility with the markets, shippers and others," he said. "Those who dispute the numbers clearly do not have this experience, have not actually done proper studies on this project to support their claims and can only venture guesses." But TransCanada numbers count each job on a yearly basis. If the pipeline employs 10,000 people working for two years, that's 20,000 jobs by the company's count. The estimates also include jobs in Canada, where about a third of the $7 billion pipeline would be constructed. The U.S. State Department, which must green light the project, forecasts just 5,000 direct U.S. jobs over a two year construction period. Even according to TransCanada, the amount of permanent jobs created would be only in the hundreds. "Those are the real numbers," said Susan Casey-Lefkowitz, director of international programs at the Natural Resources Defense Council. "The Republicans have been acting as if this is a national jobs package, and it's not." Meanwhile, one study from Cornell University said the pipeline could actually lead to a decline in jobs in the long run. One reason is that the pipeline would lead to higher fuel prices in the Midwest, the study said, and that would slow consumer spending and cost jobs. The study also said jobs could also be lost due to crop failures or other events associated with higher pollution levels the oil sands would bring. And it said more oil would mean a decline in green jobs. A number of events worked to postpone Keystone's approval, which had been expected with little fanfare. There was a series of high profile public protests over the summer. And in one major gaffe, the State Department hired a firm with ties to TransCanada to conduct the environmental review. In addition, because the route took the pipeline over a major aquifer in Nebraska, it elicited opposition from even Republicans in that state. The State Department said last month it would conduct another review and issue a decision after the 2012 election, and Obama has said he will not approve a payroll-tax extension tied to Keystone approval. Keystone supporters don't just cite jobs. The expanded pipeline is slated to carry 700,000 barrels of oil a day to U.S. refiners, about 4% of the country's daily consumption of 19 million barrels a day. That oil would technically still be imported, but from politically stable Canada. Critics say this oil may not stay in the United States, that Canada's oil sands industry is just using the deepwater ports in the United States as means to transport the oil to China or Europe. But TransCanada says that's not true, that it has contracts with only U.S. refiners, not export terminals. It's also the oil itself that's got environmentalists so concerned -- it's actually the main reason they are against the pipeline. Oil from the oil sands is dirtier than conventional forms of crude. The oil sands are just that -- oil mixed with sand. To get a usable form of crude, massive amounts of water and energy are used to separate the sand from the oil. The result is a product that has a total greenhouse gas footprint some 5% to 30% greater than conventional oil. Extracting the oil sands is also hard on the local environment. They are often mined in huge pits, the size of which are hard to overstate. Vast swaths of forest are cut down, and nearby waterways have been polluted. Companies that operate in the oil sands, including Exxon Mobil (XOM, Fortune 500),Royal Dutch Shell (RDSA) and BP (BP), have gotten better at mitigating the effects, but problems remain. 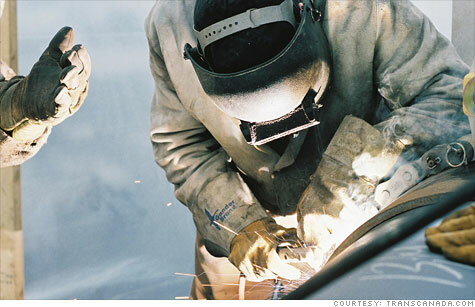 Keystone pipeline: How many jobs it would really create. TransCanada says its Keystone pipeline expansion would create 20,000 jobs, the State Department says it's more like 5,000.